Who actually believes the Democrats’ Global Warming panic attack? The National Weather Service has issued a wind chill warning until noon Friday. The forecast high for Thursday is expected to linger in the negative range at -2, dropping to -15 overnight. Strong northwest winds are producing wind chill factors of -25 to -40. Chicago’s CBS 2’s Ed Curran says as of 5 a.m., it was -7 at O’Hare International Airport and -5 at Midway Airport. 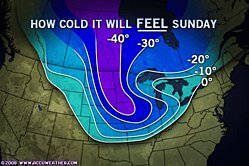 In Waukegan it was -9, in Joliet it was -11, and in Aurora, the mercury was reading -20. It is sad to come to realize that PRAVDA is more credible than the New York Times, San Francisco Chronicle, ABC, NBC and CBS. The earth is now on the brink of entering another Ice Age, according to a large and compelling body of evidence from within the field of climate science. Many sources of data which provide our knowledge base of long-term climate change indicate that the warm, twelve thousand year-long Holocene period will rather soon be coming to an end, and then the earth will return to Ice Age conditions for the next 100,000 years. Most of the long-term climate data collected from various sources also shows a strong correlation with the three astronomical cycles which are together known as the Milankovich cycles. The three Milankovich cycles include the tilt of the earth, which varies over a 41,000 year period; the shape of the earth’s orbit, which changes over a period of 100,000 years; and the Precession of the Equinoxes, also known as the earth’s ‘wobble’, which gradually rotates the direction of the earth’s axis over a period of 26,000 years. According to the Milankovich theory of Ice Age causation, these three astronomical cycles, each of which effects the amount of solar radiation which reaches the earth, act together to produce the cycle of cold Ice Age maximums and warm interglacials. Elements of the astronomical theory of Ice Age causation were first presented by the French mathematician Joseph Adhemar in 1842, itwas developed further by the English prodigy Joseph Croll in 1875, and the theory was established in its present form by the Czech mathematician Milutin Milankovich in the 1920s and 30s. In 1976 the prestigious journal “Science” published a landmark paper by John Imbrie, James Hays, and Nicholas Shackleton entitled “Variations in the Earth’s orbit: Pacemaker of the Ice Ages,” which described the correlation which the trio of scientist/authors had found between the climate data obtained from ocean sediment cores and the patterns of the astronomical Milankovich cycles. Since the late 1970s, the Milankovich theory has remained the predominant theory to account for Ice Age causation among climate scientists, and hence the Milankovich theory is always described in textbooks of climatology and in encyclopaedia articles about the Ice Ages. The first, on May 21, headed “Climate change threat to Alpine ski resorts” , reported that the entire Alpine “winter sports industry” could soon “grind to a halt for lack of snow”. The second, on December 19, headed “The Alps have best snow conditions in a generation” , reported that this winter’s Alpine snowfalls “look set to beat all records by New Year’s Day”. Easily one of the most important stories of 2008 has been all the evidence suggesting that this may be looked back on as the year when there was a turning point in the great worldwide panic over man-made global warming. Just when politicians in Europe and America have been adopting the most costly and damaging measures politicians have ever proposed, to combat this supposed menace, the tide has turned in three significant respects. First, all over the world, temperatures have been dropping in a way wholly unpredicted by all those computer models which have been used as the main drivers of the scare. Last winter, as temperatures plummeted, many parts of the world had snowfalls on a scale not seen for decades. This winter, with the whole of Canada and half the US under snow, looks likely to be even worse. After several years flatlining, global temperatures have dropped sharply enough to cancel out much of their net rise in the 20th century. Ever shriller and more frantic has become the insistence of the warmists, cheered on by their army of media groupies such as the BBC, that the last 10 years have been the “hottest in history” and that the North Pole would soon be ice-free – as the poles remain defiantly icebound and those polar bears fail to drown. All those hysterical predictions that we are seeing more droughts and hurricanes than ever before have infuriatingly failed to materialise. Even the more cautious scientific acolytes of the official orthodoxy now admit that, thanks to “natural factors” such as ocean currents, temperatures have failed to rise as predicted (although they plaintively assure us that this cooling effect is merely “masking the underlying warming trend”, and that the temperature rise will resume worse than ever by the middle of the next decade). Secondly, 2008 was the year when any pretence that there was a “scientific consensus” in favour of man-made global warming collapsed. At long last, as in the Manhattan Declaration last March, hundreds of proper scientists, including many of the world’s most eminent climate experts, have been rallying to pour scorn on that “consensus” which was only a politically engineered artefact, based on ever more blatantly manipulated data and computer models programmed to produce no more than convenient fictions. The Midwest and the East of the U.S. will barely have time to dig out from the snow and ice that blasted the regions on Friday before the next system moves through by Sunday. The extreme arctic air, being pushed to the south and east by strong winds behind the storm will pave the way for the third storm in the train that is adding to the winter woes in the Northwest. The Severe Weather Center lists the storm- and cold-related watches, warnings and advisories in effect through the weekend across the northern tier of the country. One result of many from this cold wave — car accidents, a bus nearly went off a cliff in Seattle due to icy conditions; a jet airliner slid off an icy runway and crashed in a ravine. Continental passengers on a flight from Denver, Colorado to Houston,Texas had to flee their burning airliner, sprawled in a smoke-filled ravine off a runway with the fuselage partially buckled and one engine and part of its landing gear ripped off. There was no official word yet Sunday on the possible cause of the crash of Continental Flight 1404 at Denver International Airport. The entire right side of the Boeing 737 was burned in the Saturday evening accident and melted plastic from overhead compartments dripped onto the seats. Some 40 people suffered injuries including broken bones. The conditions of two people who had been in critical condition at the University of Colorado Hospital in Denver were upgraded Sunday, one to serious and one to fair, spokeswoman Tonya Ewers said. Dr. Jay Lehr, an expert on environmental policy, told “Lou Dobbs Tonight” (Dec. 18) viewers you can detect subtle patterns over recorded history, but that dates back to the 13th Century. Lehr suggested the earth is presently entering a cooling cycle – a result of nature, not man. Lehr is a senior fellow and science director of The Heartland Institute, an organization that will be holding the 2009 International Conference on Climate Change in New York March 8-10. Another CNN meteorologist attacked the concept that man is somehow responsible for changes in climate last year. Rob Marciano charged Al Gore’s 2006 movie, “An Inconvenient Truth,” had some inaccuracies. American Idol rejects might be supporters. Now it’s understandable that Democrats win elections in Seattle and Minneapolis. Did you see how remedial that population is on American Idol’s tryouts? No wonder the Democrats won the House and Senate back. There are a lot of delusional and low IQ people who think it is cool to vote for Democrats. Nancy Pelosi is going to jump out with a new Global Warming Committee in the House. Now the Mainstream Media Progressives are feeling the backlash. So, like Stalin, Hugo Chavez and Castro, impose censorship! They are against the party platform! They need re-education camp! The Weather Channel’s most prominent climatologist is advocating that broadcast meteorologists be stripped of their scientific certification if they express skepticism about predictions of manmade catastrophic global warming. This latest call to silence skeptics follows a year (2006) in which skeptics were compared to “Holocaust Deniers” and Nuremberg-style war crimes trials were advocated by several climate alarmists. The Weather Channel’s (TWC) Heidi Cullen, who hosts the weekly global warming program “The Climate Code,” is advocating that the American Meteorological Society (AMS) revoke their “Seal of Approval” for any television weatherman who expresses skepticism that human activity is creating a climate catastrophe. What’s Next? Gulags for Global Warming Skeptics? Southern California’s Interstate 5 remains closed through the Grapevine today, due to snow and ice. Northbound lanes are shut at Parker Road, and southbound lanes are closed at Laval Road. Malibu received snow this morning. Maybe Michael More should get Al Gore on the phone and talk about a Global Cooling movie?